Introduction:	The impending loss of methyl-bromide as a soil fumigant for vegetable crops in 2005 has growers and researchers searching for the appropriate alternative means to protect their crops from soil-borne pests. One possible alternative involves avoiding the soil altogether by growing crops in perlite filled, lay-flat plastic sleeves using soilless cultural techniques. Black and White Growbags Being Tested on Typical Beds. Soilless culture is the production of crops without the use of soil. Growers around the world, as well as in the United States, extensively use hydroponics to produce many horticultural crops. Approximately $4 billion worth of horticultural crops were produced worldwide in 1998 using soilless culture (Carruthers, 1998). Benefits of using soilless culture include the ability to optimize water and nutrient supplies to the crops throughout the various growth stages and the ability to grow crops in areas where the soil is not naturally conducive to crop growth or is simply not available. Recent work comparing hydroponic growing techniques for producing food for astronauts on space missions highlights this capability (Porterfield et al., 2000). The strawberry industry in Florida is one of the industries seeking alternatives to the use of methyl-bromide for dealing with soil-borne pests. The primary production area for strawberries in Florida is in Hillsborough County where approximately 6,500 acres of strawberries are produced annually with a market value of nearly $150 million. Although many alternatives to methyl-bromide are being investigated, no one is sure which alternative(s) will be predominantly used long-term in this industry. Alternatives being investigated include flooding, solarization, and numerous chemical compounds. The problem is that no single alternative consistently and effectively controls weeds. nematodes, and diseases as well as methyl-bromide. In addition, the cost of some of the alternatives being investigated may prohibit their widespread use. Recent work by Hochmuth et al (1999) has shown that strawberries can be grown outdoors hydroponically on a commercial scale on small farms in North Florida. Also, several growers in Central Florida have experimented with various hydroponic systems with varying degrees of success (personal conversations). The objectives of our project are to evaluate the use of perlite-filled, lay-flat plastic sleeves for commercial, outdoor, hydroponic strawberry production in Central Florida and to demonstrate for growers the practical application of the perlite-based system. The research component includes both a study of the practical, horticultural abilities and challenges of these systems as well as an economic evaluation of the systems. This paper will describe the successes and challenges of the first season of the study. 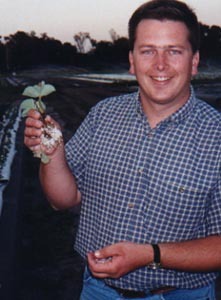 Eric Waldo With Bare-Root Strawberry. Materials and Methods: Two cultivars of strawberries ("Sweet Charlie" and "Camerosa") were grown during the 1999-2000 winter season at the University of Florida, Gulf Coast Research and Education Center at Dover. Containerized strawberry transplants were planted at the beginning of October, started bearing fruit in November, and continued being harvested until the end of March. Plants were grown in either white or black perlite-filled, lay-flat plastic sleeves and in soil. Plants grown in the soil were grown on raised plastic-mulched beds using traditional cultural practices. For the perlite system, two rows of perlite-filled plastic sleeves were laid on top of raised. plastic-mulched soil beds (Figure 1). 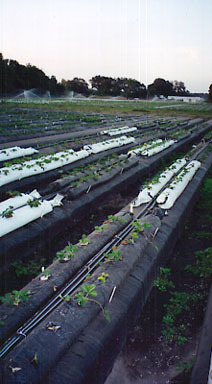 Plants grown in the sleeves received a nutrient solution consisting of water and necessary plant nutrients which was delivered through drip tape with four inch emitter spacing (Roberts Irrigation, San Marcos, CA). The drip tape was manually threaded into the bags on top of the perlite. Nutrients were added to the irrigation water using a proportioner (Dosatron, Clearwater, FL) which supplied a concentrated nutrient solution at measured amounts into the water line feeding the crop. Typically in hydroponic production, two proportioners are used to inject concentrated solution into the line. This is done to prevent elements such as calcium and phosphorous from reacting in the solution containers. However, in this project we obtained a pre-rnixed concentrated liquid fertilizer solution from a local fertilizer company (Chemical Dynamics, Plant City, FL) which did not react to form precipitates. Because we had this solution, we only needed to buy one proportioner for the project. The concentrated solution was identified as a 4-6-2 with micronutrients. The proportioner was adjusted so that the plants received a final nutrient solution containing approximately 85 ppm N before flowering began and approximately 120 ppm N after flowering began. The nutrient solution was applied to the plants several times a day for several minutes per an event. Times and frequencies of irrigation events were adjusted during the season according to the plants' needs at various times of the season. Irrigation requirements were determined by observing the amount of leachate from holes in the lower sides of the bags during an irrigation event and by observing plant and media characteristics. Yield data and observations were recorded throughout the season. Data was analyzed using analyses of variance and means were separated using Tukey's Studentized Range Test at P O.05. Total yields from plants grown in perlite in either white or black plastic sleeves were similar to total yields from plants grown in soil. Yields were higher from plants grown in perlite for the cultivar "Camarosa" during January and February (Figure 2). This could have economic implications as earlier fruit often means higher prices in the central Florida strawberry industry. No runners were observed to grow from the strawberry plants grown in the perlite bags. This has economic implications as runners are often removed from the strawberry plants grown in soil in this area. This removal of runners requires labor which has a significant cost. The use of a single-source concentrated nutrient solution worked very well. This eliminated the need for a separate concentrated solution holding tank and for purchasing a second proportioner. The use of drip tape with four inch emitter spacing threaded through the tops of the perlite-tilled bags. rather than using individual emitters and drip stakes, worked very well and reduced costs considerably. This experiment is scheduled to be repeated during the upcoming strawberry season. Comments and suggestions from growers are encouraged. Hochmuth, R.. L. C. Leon. and D. A. Dinkins. 1999. The development and demonstration of an outdoor hydroponic strawberry production system for North Florida. Proc. Nat. Ag. Plastics Conf. 28:165-167. Porterfield, D.M., T.W. Dreschel, and M.E. Musgrave. 2000. A ground-based comparison of nutrient delivery technologies originally developed for growing plants in the space-flight environment. HortTech. Jan-Mar. 10(1): 179-185.